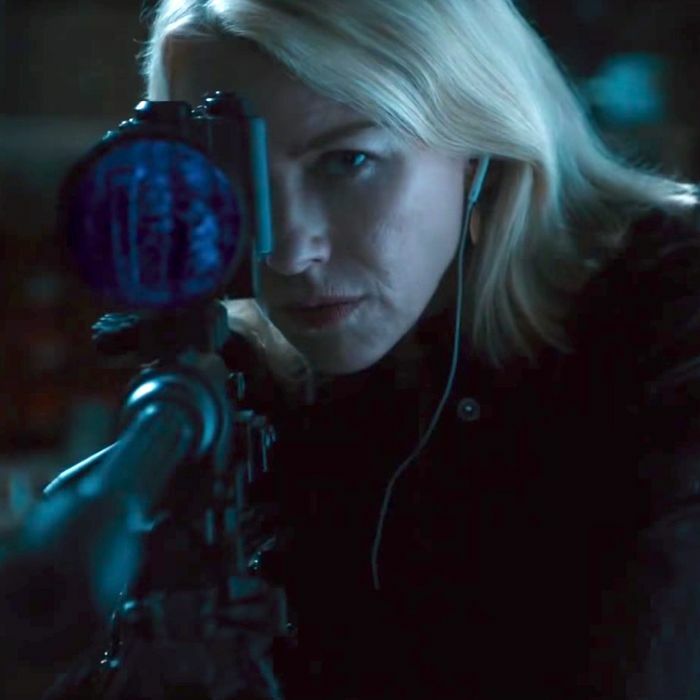 Naomi Watts, in the tree house, with a sniper rifle. This review contains major spoilers for The Book of Henry, though nothing can really spoil The Book of Henry. “Good stories remind us of who we want to be,” intones Henry (Jaeden Lieberher) in a voice-over over the final minutes of The Book of Henry. Which raises the question: Who in The Book of Henry do you want to be? The 11-year-old genius with a tragic illness and a posthumously revealed homicidal streak? The single mother with a first-person-shooter addiction, a seemingly bottomless bank account, and mad ukulele skills? Or maybe it’s the alcoholic waitress who kisses young boys on the lips when their mothers are out of the room. (Don’t worry, the movie thinks it’s cute!) By the end of the film you may just decide you want to be Peter (Jacob Tremblay), Henry’s younger brother, who mostly just watches the rest of the movie happen around him in a daze, but is adorable. Who doesn’t want to be adorable? Such is the cornucopia of characters and scenarios in The Book of Henry, a film written by novelist Gregg Hurwitz and directed by Jurassic World’s Colin Trevorrow, seemingly in a vacuum far, far away from anything vaguely resembling actual things that happen and people who exist. It does not suffice to call The Book of Henry bad; it’s nonfunctional, so poorly conceived from the ground up as to slip out of the grasp of the usual standards one applies to narrative film. It might be admirable if it wasn’t such torture to watch. Journalists and critics attending screenings of The Book of Henry were asked “not to reveal the family’s secrets” in our coverage, and I think it says a lot about the unintelligible nature of the film that I have no idea what this is referring to. The movie changes its mind about what it is and what it wants to say every 10 to 15 minutes. Seemingly pertinent pieces of information are brought up and never revisited; Sarah Silverman’s Amy Winehouse look-alike waitress more or less disappears after her intimate encounter with a hospitalized Henry. (Again, don’t worry, it’s supposed to be cute!) For a long time I thought that the boys’ absent father might be revealed to have been a time traveler or a wizard (thus the improbably professional-looking tree house and flush bank account), but sadly, nothing so satisfying occurs. The script is inexcusably bad and accounts for most of the film’s problems. But Trevorrow can’t draw a single emotional through line out of the muck, leaving his cast stranded in a directionless jumble of half-arcs. There’s a feeling of collage to the direction. Take any two- or three-minute segment out of context and it would seem recognizable enough as a movie: the heart-tugging score, the cute kid one-liners. But assembled as it is, the movie starts to feel like an exquisite corpse, a film that forgot what it was five minutes ago, both structurally and emotionally. By the time Michael Giacchino’s score is swelling over an 8-year-old rapping at a talent show while Naomi Watts speeds home to murder her neighbor, the film seems so detached from the rest of the world as to levitate. Moreover, it’s impossible to discern what it was about this nearly two-decade-old script that Trevorrow was passionate enough about to race back to as soon as he’d wrapped on Jurassic World. Trevorrow may not have written it himself, but it’s easy to worry about a filmmaker who found anything compelling in Hurwitz’s pages, or who fails so spectacularly in making us see whatever he saw in them. The Book of Henry is a disaster to its bones, as mind-bendingly broken as The Room or Birdemic or any other piece of cult outsider art. Except Trevorrow, whose next project is Star Wars: Episode IX, is about as insider as it gets. And somehow, that makes it a lot less fun. Why Did These Three Directors Make the Same Movie?